I have included this poem I wrote in 2002, because I was watching '50 Years of Gardeners' World Live' at the NEC Birmingham on television and there was a sequence about gardening through the decades, which my poem tried/tries to evoke. 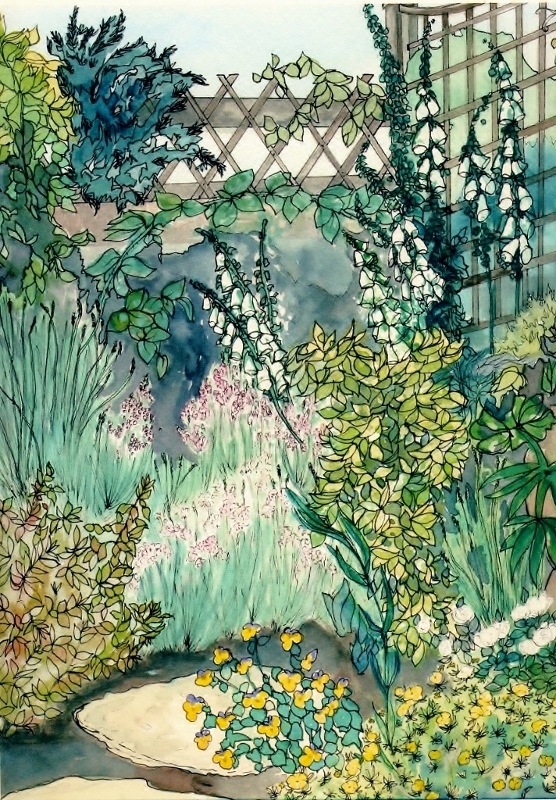 It is illustrated with a picture I painted of a corner of our garden in early summer painted in watercolour, acrylic and pen and ink. restructured with soil from pond, below. as holidays are spent deck-chaired, fenced in. as summer tries to erupt in Britain. down to blue, iris-fringed water. beyond stream singing its aria. set off by pebbles, palms and Arabian pots hosting trees. behind trellis, painted blue, embroidering boundaries. becomes the stargate between house and garden.